Instantly translate foreign languages with one click. Translate full documents in PDF, Word, Excel, Powerpoint and keep your formatting. Are you saving money on translation costs yet? Translate text with just one click and save on translation costs. With our translation software you can instantly translate chat conversations, emails, documents and even entire websites to and from English, Spanish, French, over 150+ languages. Convert full documents, no matter how large, while retaining your original formatting: layout, images, tables, headers, bullets. Fast one click translation for Word, Excel, Powerpoint, Outlook, PDF, HTML, and many other of your favorite programs. Need to translate a variety of different languages? Save by ordering one of our multilingual packages. The more languages you order, the more you save! Hurry and grab yours today and you'll also get our bonus Video Training bundle! More Languages . . .
SYSTRAN recently released the world's first translation software using deep learning and artificial intelligence. Much like a human translator would learn to translate, the Pure Neural translation engine simulates the human brain, which has led to remarkable improvements in translation fluency and accuracy. Available in Cloud or Server Editions. Three main products to choose from. Available in SYSTRAN Professional and SYSTRAN Essentials. Designed for the individual or small company needing to translate documents from thier local computer. Uses Rule Based technology for a high gisting level of accuracy. Build additional dictionaries with your own terminology to increase accuracy. Instantly translate full documents and retain your original formatting. Choice of products that can support, Word, Excel, Powerpoint, Outlook, and PDF. Designed for companies that need software installed on internal servers for additional security compliance and larger translation jobs. 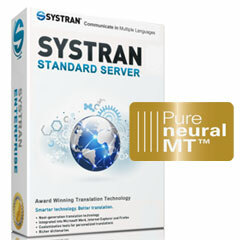 Includes the highly accurate Pure Neural translation engine as well as Statistical and Rule Based. Over 150+ language combinations available and more coming soon. Additional features available -MS Office Applications, Dictionary tools, Translation Memory, API, plugins for Voice, Skype, and more. The highly accurate, Pure Neural translation technology is now available for a fraction of the cost. Designed for a wide range of customers that need the power and features available in an enterprise edition, but without the costs of running your own server. Sign up and start translating immediately, perfect for anyone small or large, companies, professional translators and more. Translate direct from your browser by uploading a file to be translated, then open in Word, Excel & PowerPoint.. I have already used it, and am loving the ease of communication with my Spanish counterparts. Not having been able to communicate prior to this has caused frustration on both sides – I don't know why I didn't look for this sooner. Thank you so much for all your help. You've been really fantastic and I will be sure to recommend you to any other translators who may be looking to purchase software.